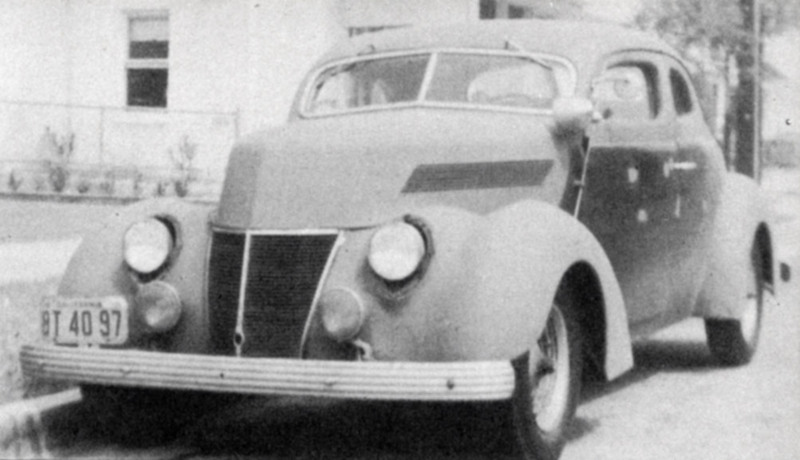 The 1937 Ford, along with the 1938 models were often considered the Ugly Ducklings from the FoMoCo. Yet they still were Customized, and with great success. The 1937 Fords were introduced on November 6, 1936. Responsible for the designs was not Ford stylist Bob Gregorie, who was busy working on the new Lincoln Zephyr’s but rather the Briggs Manufacturing Company staff. This team worked under the leadership of John Tjaarda. the Briggs crew included Alex Tremulis, Bob Koto, and Phil Wright, all car stylists of considerable stature. 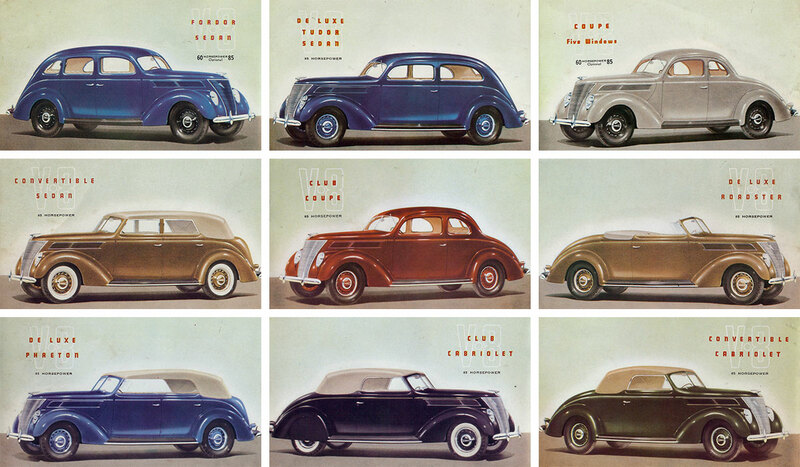 Yet they team designed a series of models for the 1937 year that a lot of people consider (together with the ’38 Fords) as the most ugly Fords ever created. One of the reasons the car was not very much loved for its looks might have been caused by a proportional issue. Henry Ford, personally ordered that the car’s overall length needed to be reduced from 182.75 inches to 179.5. Which might not sound like a lot, but can be seen as the same difference from a Ford to more classy looking Mercury. The shortening from its early concepts was enough to make most of the models look a bit stubby, and not as elegant as the original designs proposals had looked like. The 1937 Ford came in a large selection of models, and they all looked great. 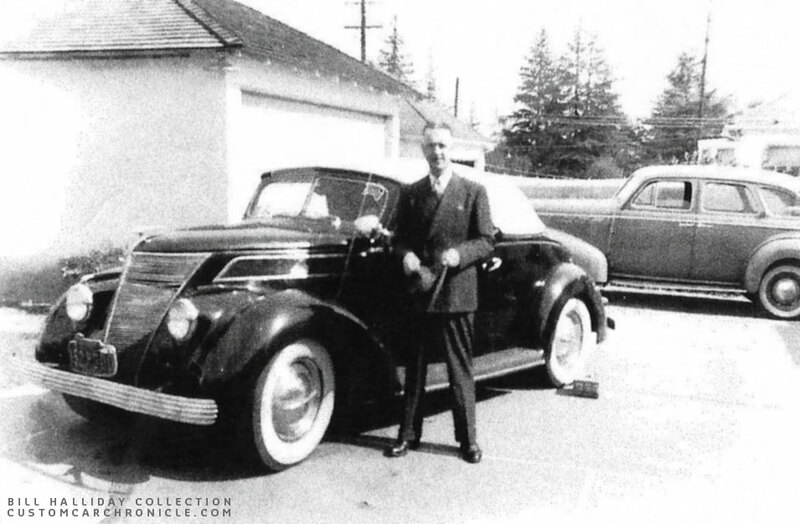 Despite the fact that the ’37 Ford was considered not to be very attractive, the cars were still being custom restyled. Mildly restyled, with dress up accessories, or a bit more elaborate with chopped windshields and padded tops on the convertible models. The narrow and pointy grilles and molded in headlights of the ’37 Ford gave the car an sort of instant Custom Looks. So much that these cars did not really need a whole lot to already look more attractive. Lowering the suspension and chopping the windshields perhaps brought back the proportions the original designers had been looking for. 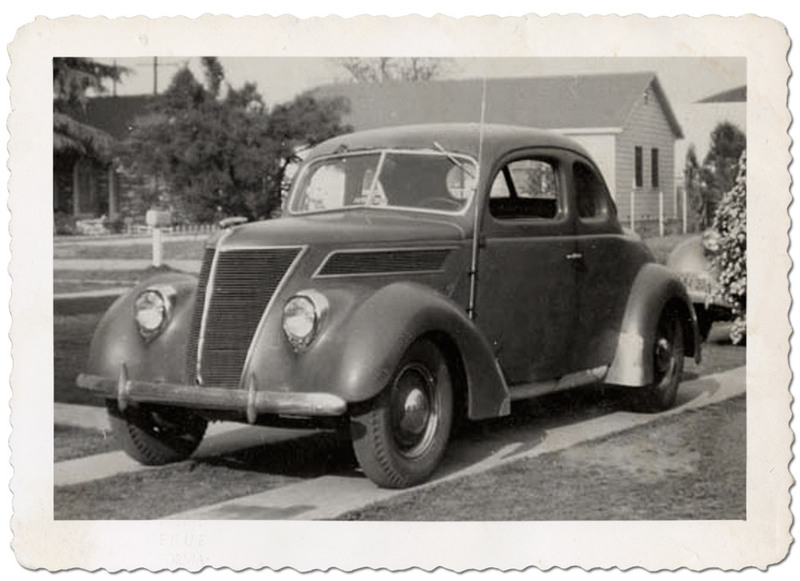 I have been collecting photos of Custom Restyled 1937 Fords for many years. This “Ugly Duckling” has a special place in my heart. 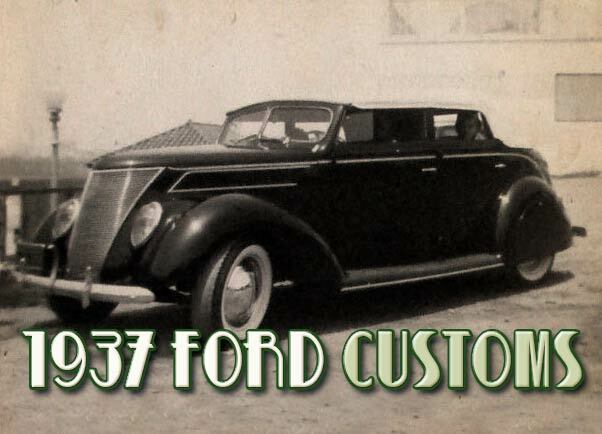 In those years collecting photos I have found out that most of the Custom Restyled ’37 Ford were mild Customs, and unlike other year Fords, most were not treated with the full Custom treatments. There are a few exceptions, like the Glen Johnson Coupe, but in general the ’37 Fords were moderately restyled, just because that fits these cars so well. 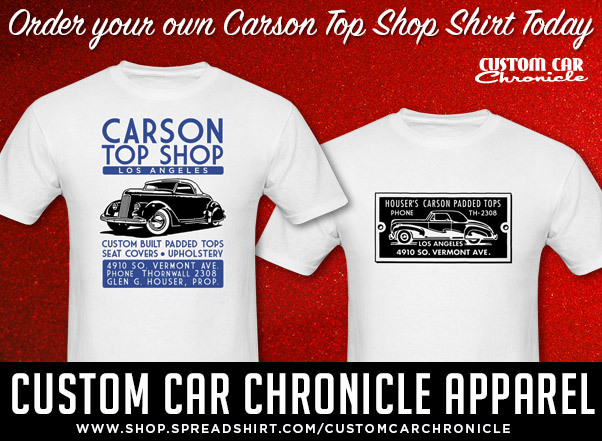 Most were Custom Restyled in the 1940’s and unlike other year Fords very few were treated as Custom Cars in the 1950’s. 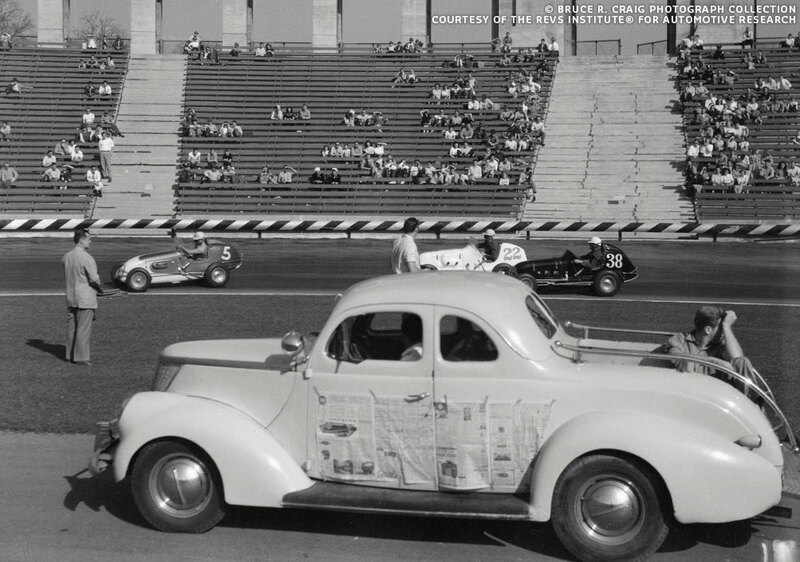 In the research for this article I have also come across a lot of photos of old ’37 Fords as race cars back in the 1940’s, a lot of the ’37 Ford ended up being wrecked in races. Probably more so than any other year Fords. Judging the amount of photos of Custom Restyled ’37 Ford’s I have come across I would say that the ’37 Ford Convertibles is the body style that was mostly restyled. Which makes sense since most of the Custom restyling on these cars was done back in the 1940’s, and at the time it was relatively easy and cheap to have your convertible chopped and an padded top build at the same top shop. At least it was much easier and cheaper than a Coupe of sedan. 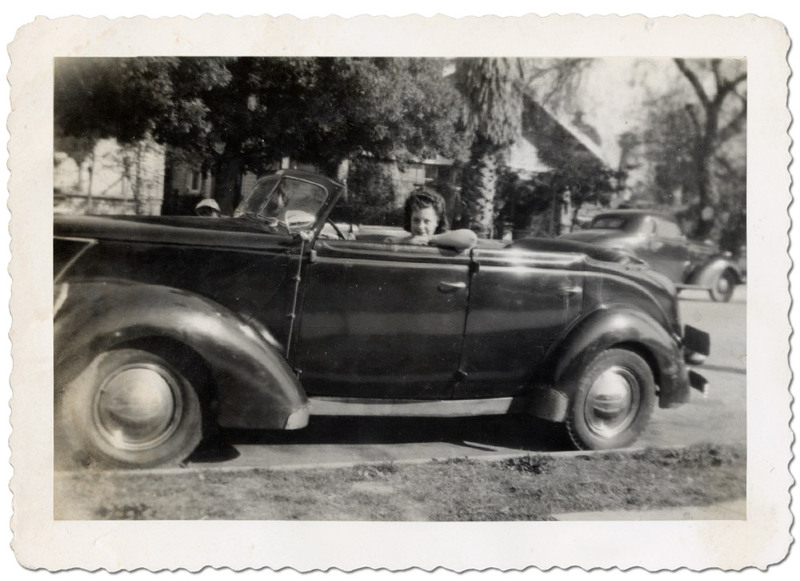 The convertibles were very popular in California, due to the year round great weather. If you moderately lowered the ’37 Ford convertible, added white wall tires, skirts in the back and a low chopped Padded Top with sloping profile I think the end result came close or even better enhanced the original design ideas from the team at FoMoCo. Earl Bruce standing proud with his beautifully restyled ’37 Ford Convertible. ’41 Ford bumpers, chopped padded top, solid hood sides, early style single bar flipper hubcaps, skirts, wide whites, and a matching suit. 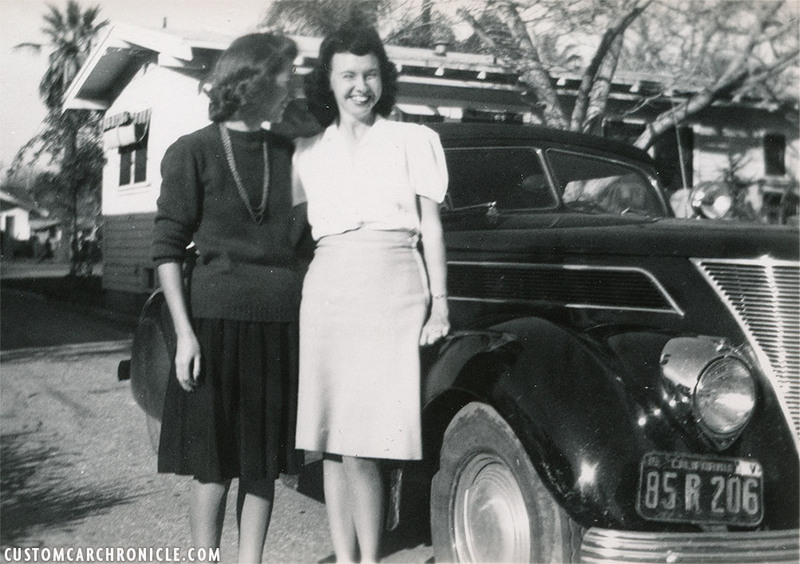 Snapshot taken during WWII shows two lovely ladies posing with a chopped dark padded topped convertible with single bar ripple disk hubcaps, DeSoto Bumpers, Skirts, Spotlight(s) and chrome plated aftermarket sealed beam headlights. 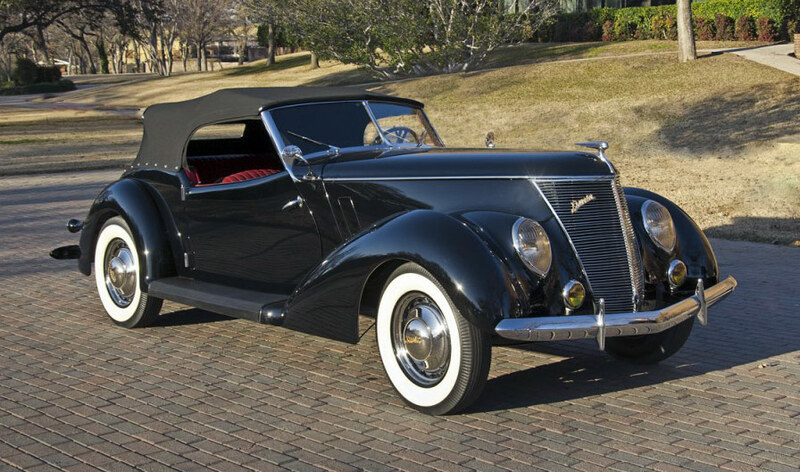 Very similar ’37 Convertible as above, with the same Custom Restyling, except this time the car was outfitted with a light colored padded top. Halliday family customized 1937 Ford convertible with mildly chopped windshield, padded top, wide white wall tires, single bar flipper hubcaps, single Appleton Spotlights and 1937 DeSoto bumpers and exteneded headlights. 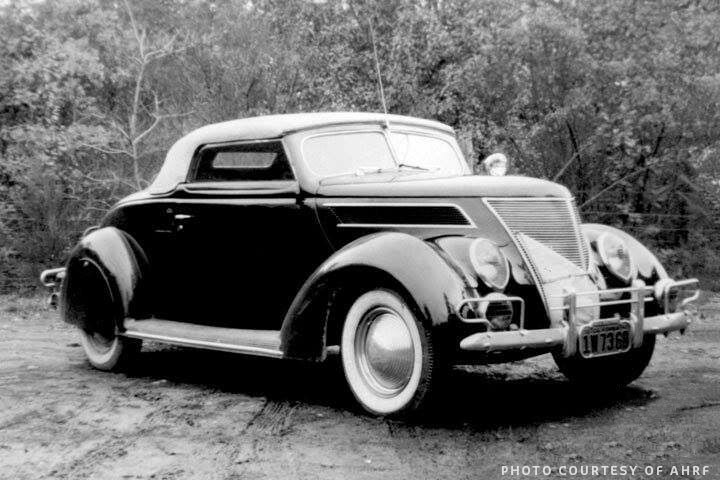 This photo was taken in 1940 and shows a chopped ’37 Convertible with smooth hood sides, skirts, dual Appleton Spotlights, lowered suspension and custom hubcaps on wide white wall tires. Late 1930’s or early 1940’s photo by Dean Batchelor. Dave Riddle shared some photos of his grandfather’s ’37 Chopped padded topped ’37 Ford convertible with smooth hood sides. 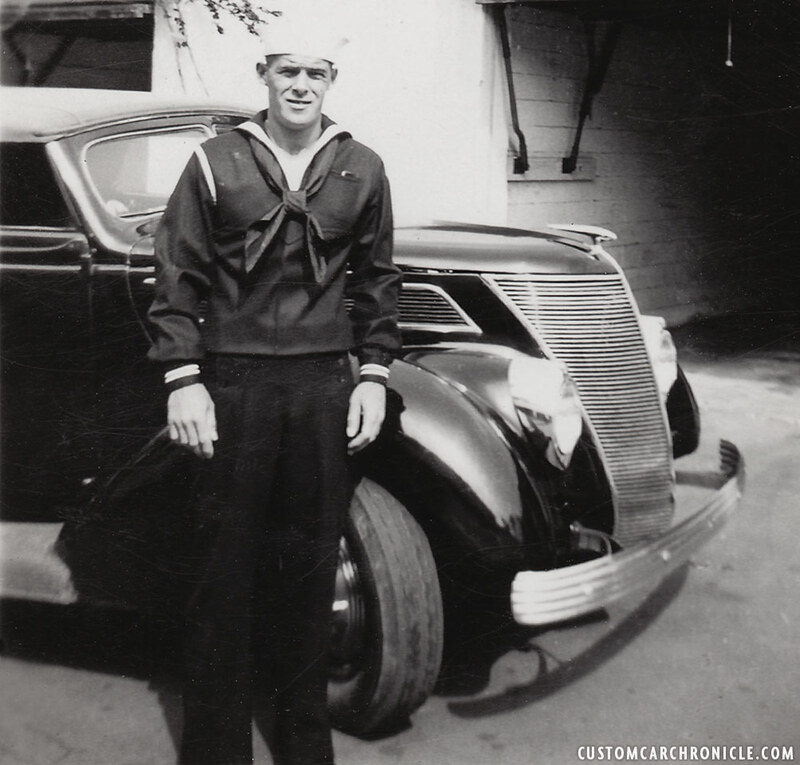 Dave grandfather posing with his Custom Restyled ’37 Ford with 1940 Oldsmobile bumpers. 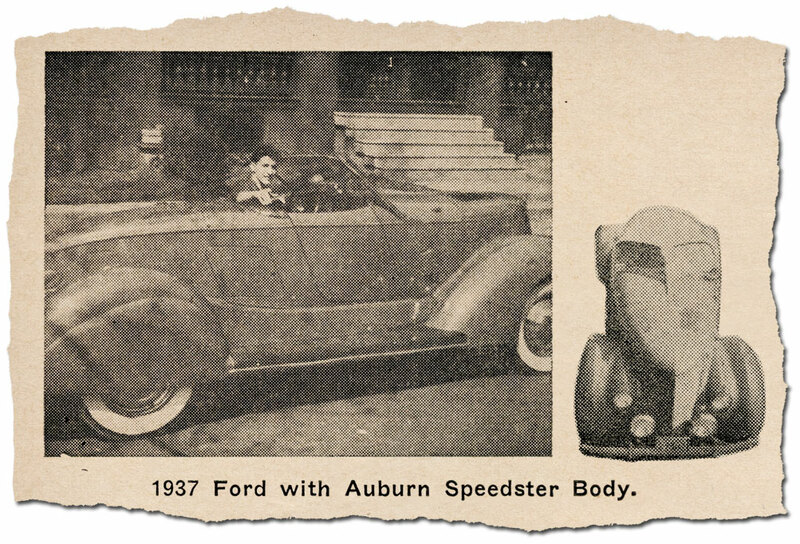 Ford called this long topped Convertible the Club Cabriolet. 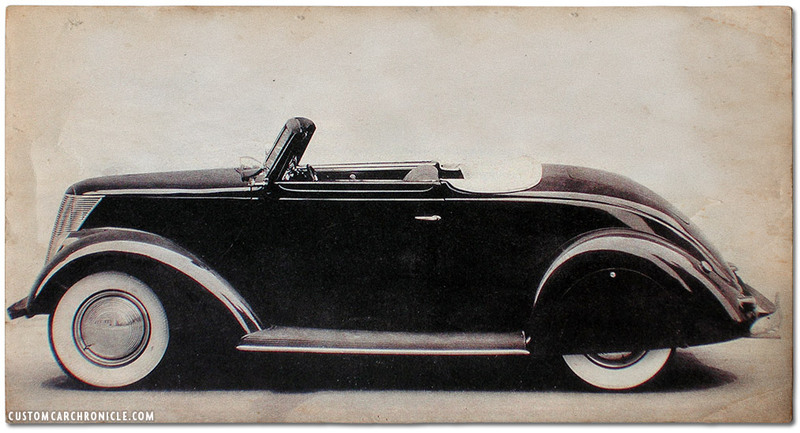 Although most customs are based on the shorter top Convertible Cabriolet, these long topped car look really great with a chopped padded top, as this early 1940’s sample shows. 1937 Ford mixed with an early Auburn Speedster for the ultimate Boat-Tail Custom. 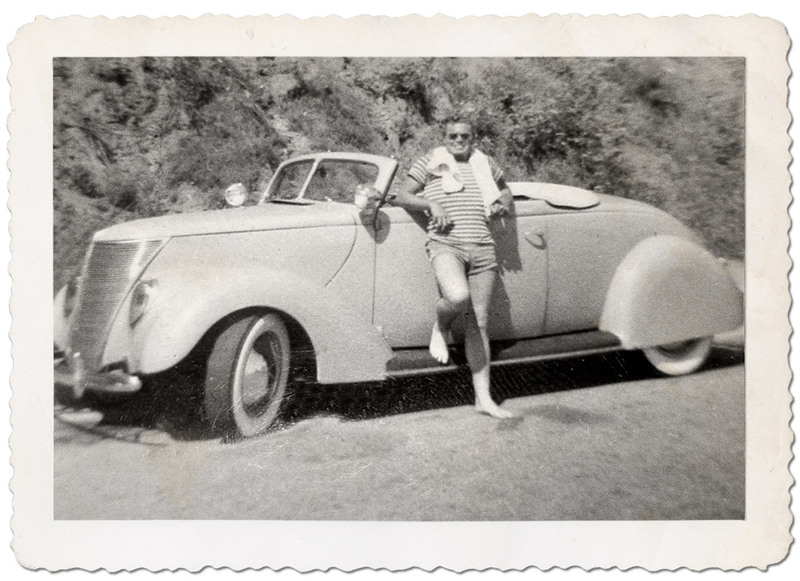 Around 1937 France Coachbuilder Howard ‘Dutch’ Darrin moved to Los Angeles and the first car he created in Los Angeles was this beautiful ’37 Ford Roadster base on a Model 78 Deluxe. 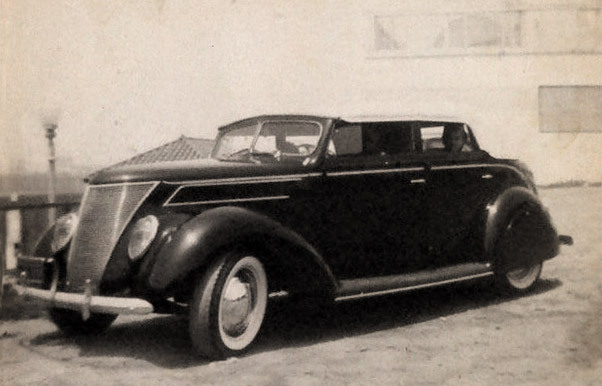 The Sedan convertibles and Phaeton models of the ’37 Ford were also seen a lot as mild and a little wilder Custom Cars. The cars were much more roomy than the ‘convertibles, so they were ideal if you drove around with friends, or even if you had a family. Just like with the regular convertible the chopped windshield and padded top option was the number one choice, judging the vintage photos. If restyled well, with the right proportions, as in lowered suspension, chopped windshield and padded top with nice round rear quarter corners these four door convertible sedans had a certain classic high end look, which was very desirable in the late 30’s early 1940’s. up to the mid 1940’s. Unidentified ’37 Ford sedan convertible with chopped windshield, removed running boards with modified front fenders, custom made frame filler panel, stainless steel rock shields on the rear fenders, smooth hood-sides, wide whites and ripple disk hubcaps. Most likely a matching padded top was left home before going to the dry lakes where this photo was taken. Interestingly it looks like the car had a single pin-stripe at the beltline, something not commonly seen on early Customs. 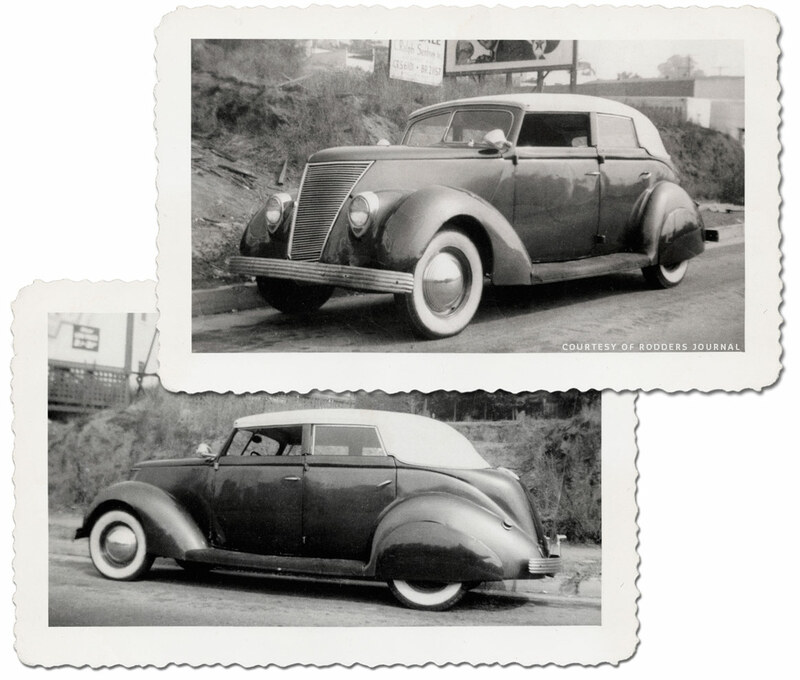 Steve Box took these two photos of a nicely done ’37 Ford Convertible Sedan in California in the late 1940’s. The car did not have a chopped windshield, but was outfitted with a non folding Padded top. 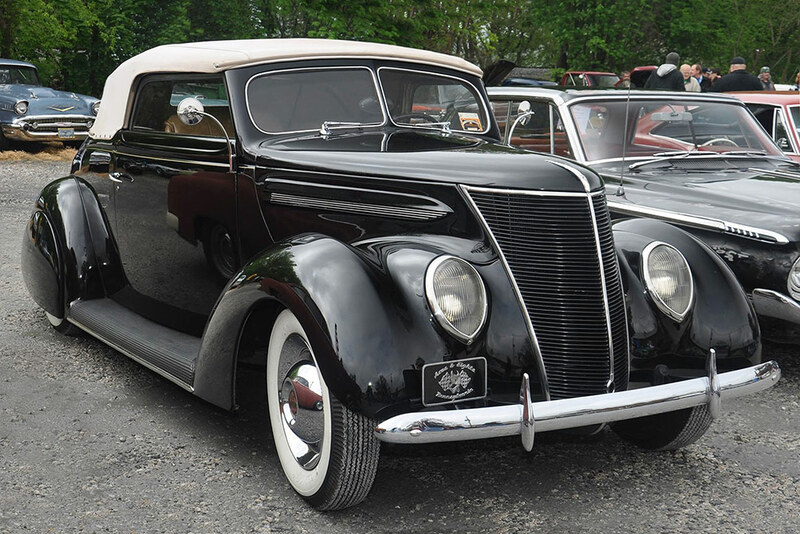 It also had teardrop fender skirts (that were slightly to small to cover the ’37 wheel openings., smooth hood sides, ’37 DeSoto bumpers, Appleton Spotlights, smooth hood sides, lowered stance and sealed beam headlights. 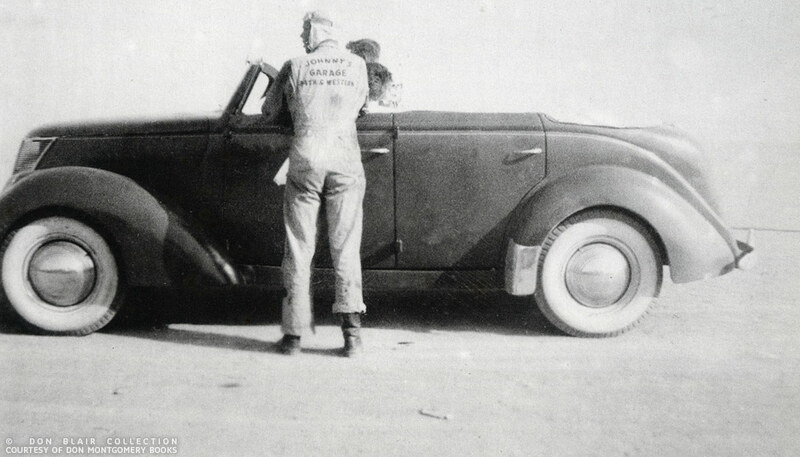 The taillights appear to be low mounted ’38-39 Ford teardrop units, or perhaps he just mounted complete ’38 Ford rear fenders. Very Classic and beautiful Custom Restyled 1937 Ford Phaeton most likely done in the late 1930’s, perhaps early 1940’s. It features a slightly lower stance, chopped windshield, with padded top, custom side trim, possibly from a ’38 Ford. small diameter single bar flipper hubcaps, fender skirts and white wall tires. 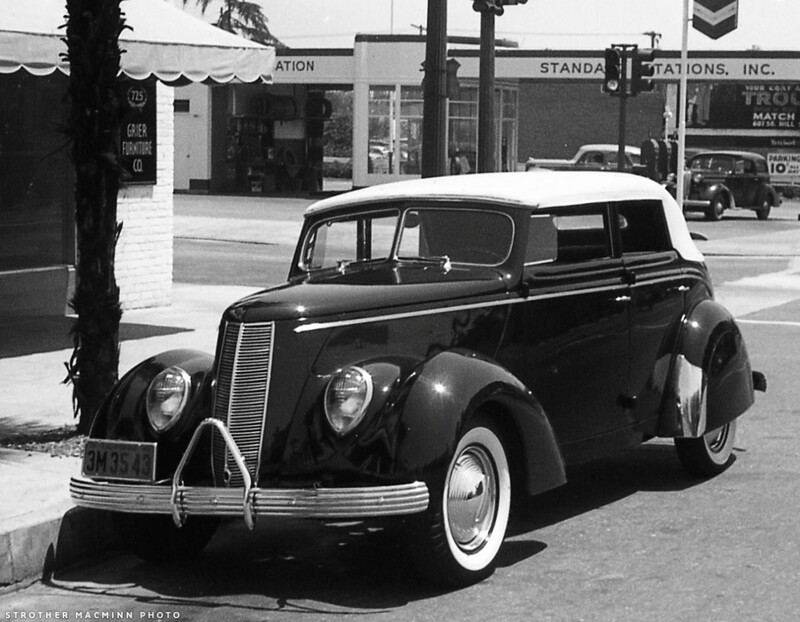 ’37 Ford Convertible Sedan owned by a Pasadena Ford dealer’s son photographed in 1940. At first I thought it might have been a later version of the photo above, but the shape of the padded top and the location of the side trim is different. This is a very nice ’37 Ford Custom though. with the chopped padded top, DeSoto bumpers, added side trim, smooth hood sides and removal of the running boards. 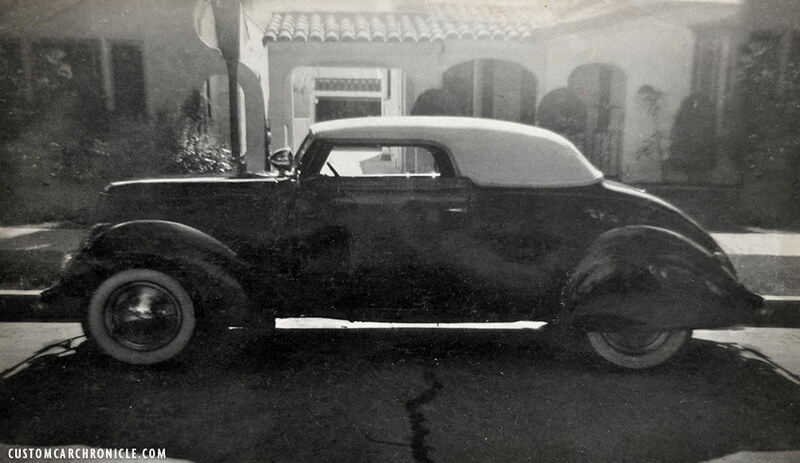 This ’37 Ford, photographed with 1940 California plates is the same car as the photo above. But this time it has a narrowed stock grille with the sides filled in. Interesting to see the new belt line side trim has been extended compared to the photo above to cover the grille side panels. 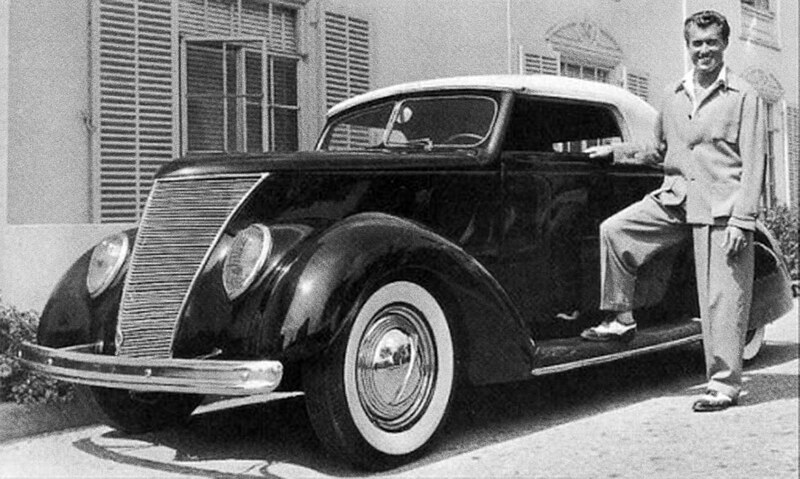 1937 Sedan Convertible with chopped windshield, removed running boards with an Hollywood accessory kit to cover the holes and gaps left by the running boards. I came across this photo online many years ago. It was mentioned it was an ’40 Custom with chopped Carson top. Have not seen it since. I hope it got fixed, and hopefully the big and little tires were replaced with regular size tires for a more Custom feel how it most likely looked in the 1940’s. Unlike the convertible ’37 Fords, most restyled ’37 Coupes remained un-chopped and were restyled only mildly, there are of course a few exceptions to this. I’m not sure why this was, perhaps most owners mildly restyled their ’37 Ford Coupes just to make them less “ugly”. And then obviously would not go all the way. Previous year Fords were more often chopped and further customized, same goes with later years. 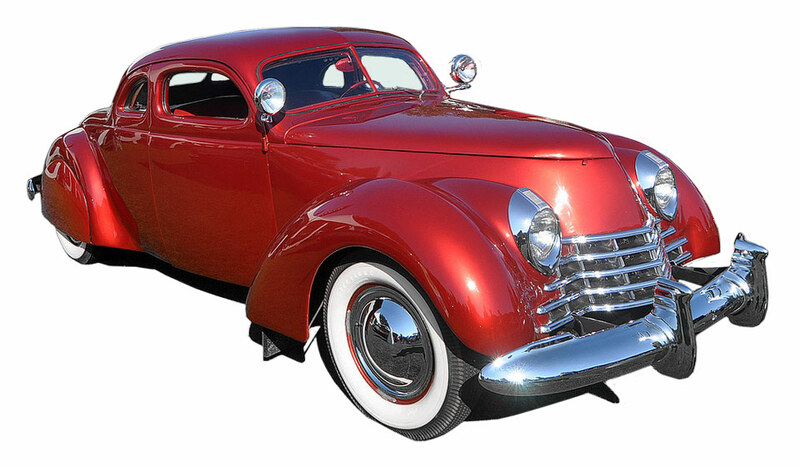 I think it really is a shame not more ’37 Ford Coupes went with the full Custom treatment. With a proper chop I think these ’37 Ford could have looks very nice as full custom. Both in the 1940’s as well as in the 1950’s, then perhaps with more restyling going than the decade before. 1937 Ford Coupe transformed to pick up truck for the race track. The fenders were modified with new headlights at the front and extensions at the rear to match the longer bed. Smooth hood sides and and early Cal Custom ’37 Ford accessory hood trim piece. 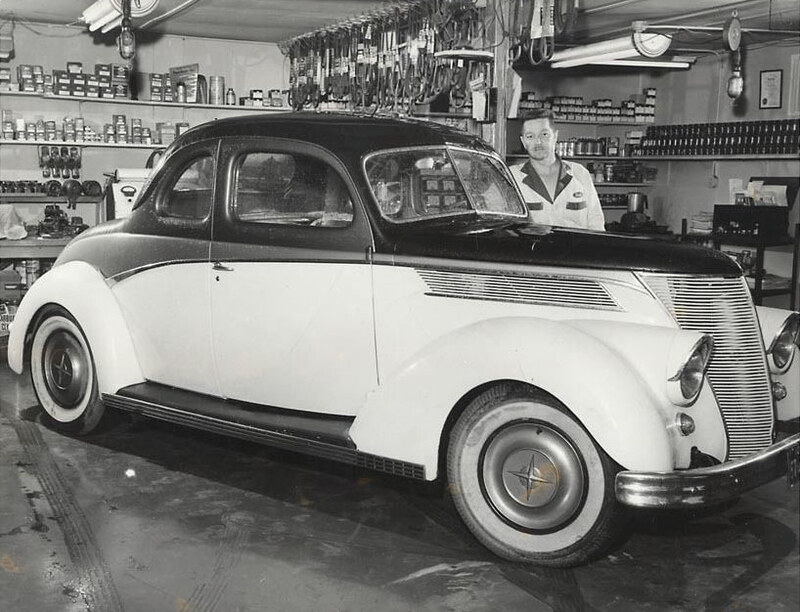 The car was originally Customized in 1938. Mildly dressed up ’37 Ford Club Coupe. The club coupe had longer sedan doors and therefor longer cabin and shorter trunk. This one looks nice with the white wall tires and early small diameter single bar flipper hubcaps. Regular ’37 Ford Coupe with lowered suspension with a bit more taken out of the rear. My guess is that it normally has a set of fender skirts installed to hide the stock rear hubcaps. On the front is has Custom hubcaps and solid hood sides. Regular Coupe with the running boards removed and an Hollywood Aftermarket kit to fill the holes. From the Dan Post Blue Book of Custom Restyling comes this unfinished chopped Coupe with the running board removed and the grille cut down till the bottom of the hood sides. The hood sided have been welded to the hood and the top portion, above the grille was filled in with new sheet metal, giving the hood an almost ’39 Ford look. The California License plate is from ’48-’50. 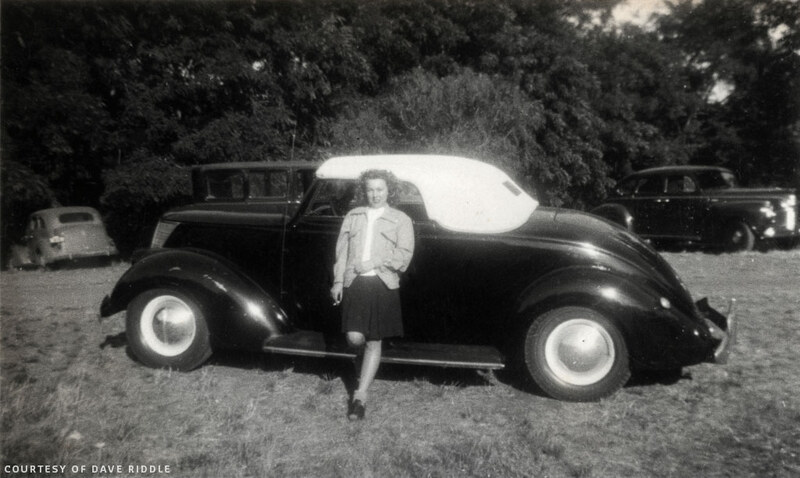 This photo is from up in the mid 1950’s and showds an restyled, or perhaps better said dressed up ’37 Ford Coupe. Extended headlights with eyebrow rings, ’49 Plymouth bumpers, Running board trim made from ’56 Ford side trim material, custom side trim and a two, or perhaps three tone paint job. One of the wilder Custom Cars based on the ’37 Ford was Glen Johnson’s ’37 Ford Coupe. 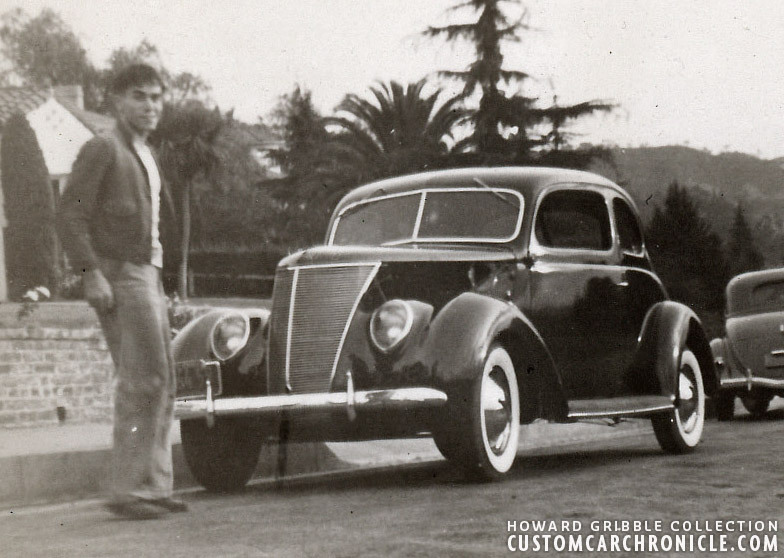 Glenn was inspired to built the car when his friend Carl Gratz had bought a custom 1936 Ford 5-window coupe that used to belong to Tommy Jamiesson and Bob Campbell, with body work by Howard Fall. 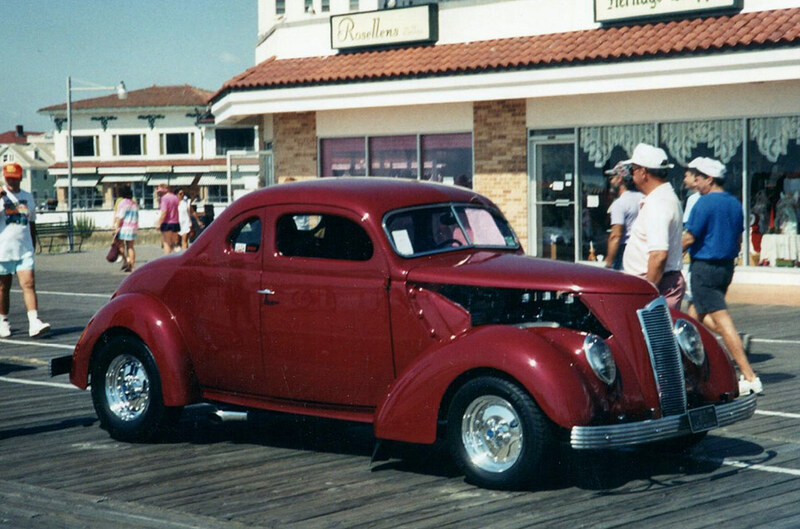 Glenn wanted to built something similar and used a 1937 Ford coupe as a base. 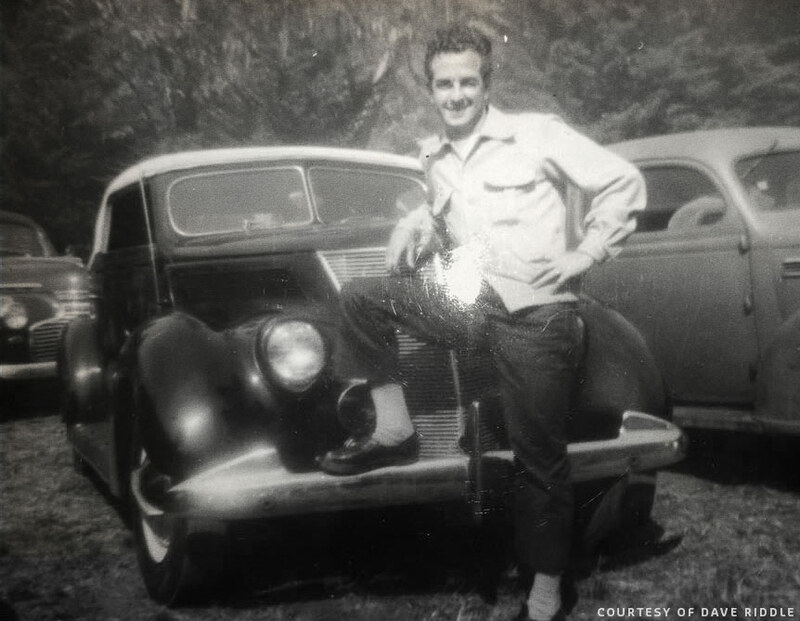 Glenn started to work on his car around 1947. He chopped the top 4 inches front and a little more in the back to give it a better flow. The panel between the trunk and rood was stretched to compensate for the now shorter top, and the A-pillars were leaned back a little. The running boards were removed and the body channeled over the frame until the bottom of the body sat level with the bottom of the frame. The front and rear fenders were raised and re positioned to compensate for the body drop and molded to the main body. New hood sides were fabricated to fill the now much smaller openings. Pieces of the original panels were combined with new shaped panels to form a single unit filling in the original top portion of the grille. This unit was later welded to the cowl. At the front Glenn heavily modified a 1947 Cadillac grille to fit the new lines of the car. 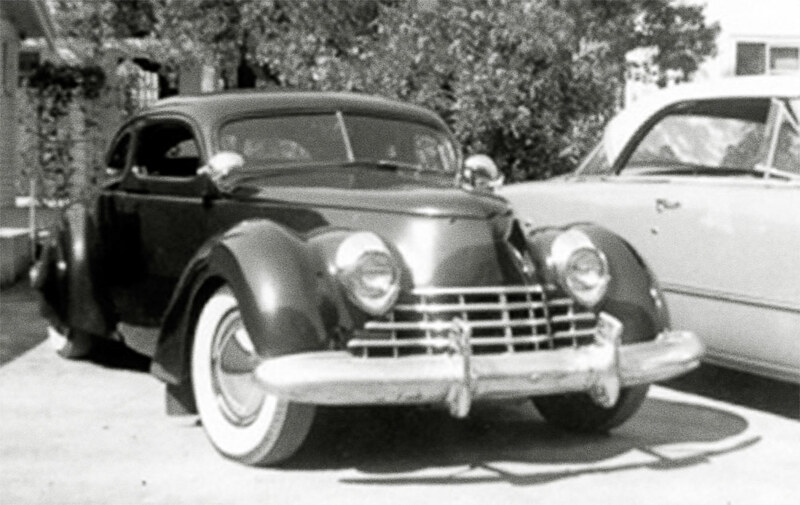 The stock headlights were replaced with 1940 Ford units and a 1941 Cadillac front bumper was installed. At the rear a split bumper of a 1946 DeSoto was installed 46-48 Ford taillights were mounted on the splash pan just below the DeSoto rear bumper. When the car was almost finished it caught fire and he lost most of the interior, and perhaps even more important all the lead worked. Glenn moved to Glendale and redid the car while he lived there. 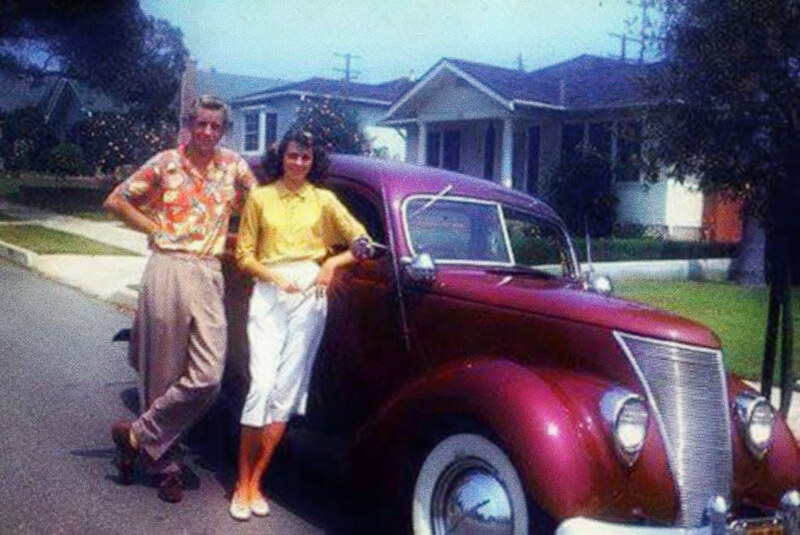 Glenn worked on the car from 1947 till 1951 using only primitive tools in his own garage and backyard and eventually finished it in ruby maroon. The car was in several magazines including the Restyle your car booklet from 1952, and the most important on the cover and with a long feature story in Hot Rod magazine of April 1952. Early stages of the Glenn Johnson ’37 Ford Coupe. 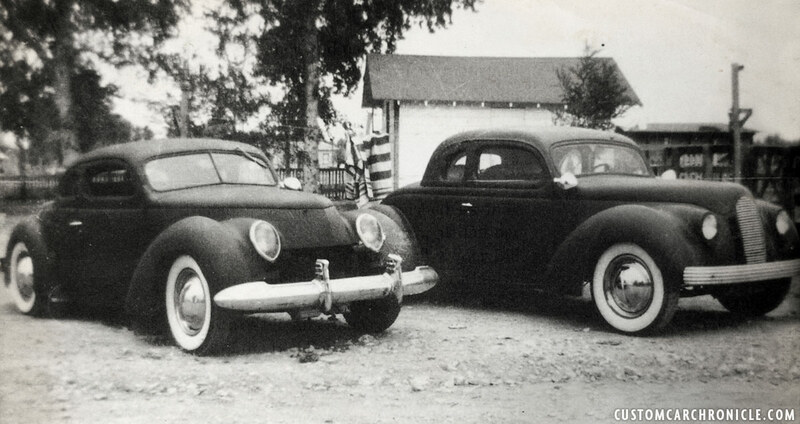 Glenn Johnson’s ’37 Ford coupe on the left sitting next to the car that inspired Glenn to start his. 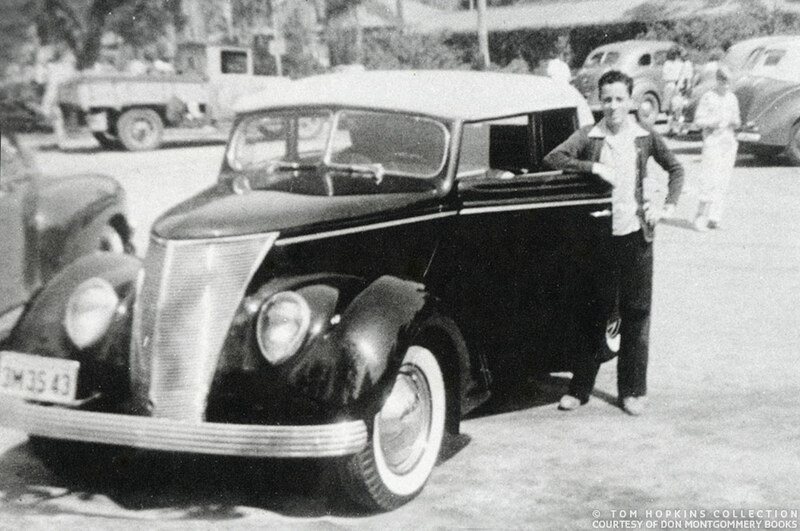 Glenn’s friend Carl Gratz had bought this early reatyled 1936 Ford 5-window coupe that used to belong to Tommy Jamieson and Bob Campbell. By now Glenn had mostly finished his coupe, which was in primer and awaiting final assembly. When Glenn was finished with his Coupe around 1951, the car did not look much like the ’37 Ford he started with anymore. The raised fenders, Cadillac grille, bumper and ’40 Ford headlights had completely transformed the cars looks. The car is now completely restored and part of the Joe Bortz Collection. 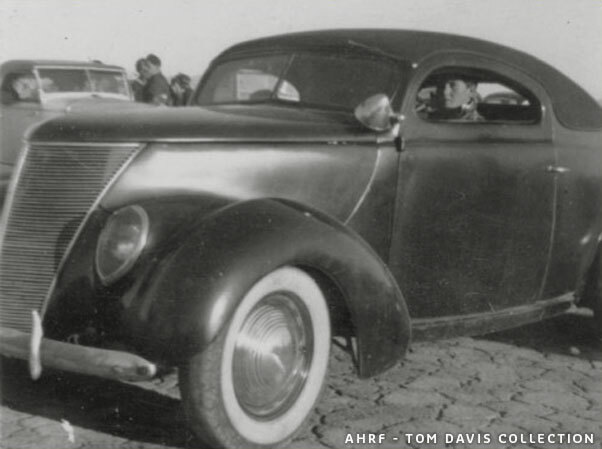 Hank Heimbach owns this chopped ’37 Ford Coupe with filled grille surround and Packard Clipper grille, removed running boards and DeSoto bumpers. All the work on it was done the old fashion way Hank mentioned, so it more than likely started out as a Custom in the 1940’s. Sadly there are no old photos to proof it. From all the 1937 Ford models (with the Woodies left out) the two and four door sedan models are the least often Custom Restyled. I have come across only a handful of snapshots showing the sedan’s Custom Restyled. Even less than cars from previous and later years. 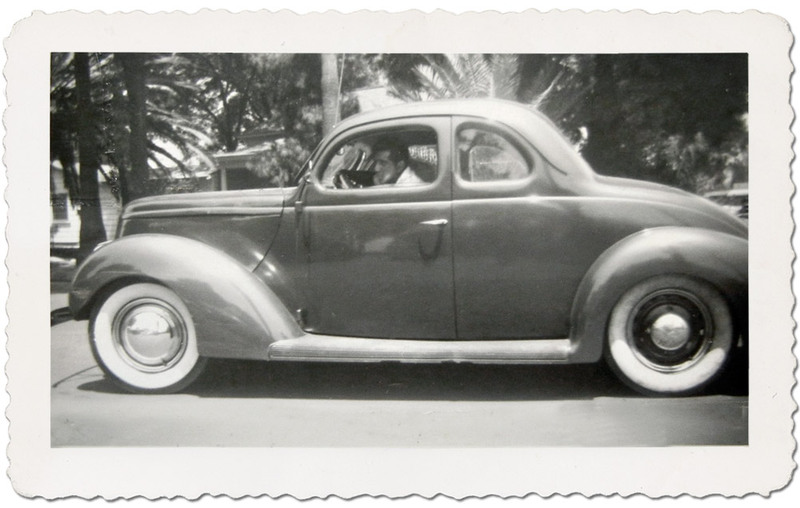 The photo was taken in the later part of the 1930’s and the ’37 Ford sedan was already fully customized. Chopped and turned long roof coupe, smooth hood sides, removed running boards etc. More on this Mystery Custom car be found HERE. Late 1940’s photographed mildly restyled (dressed Up) ’37 Ford 4-door sedan with Appleton Spotlight(s), accessory bumper guards and single bar flipper hubcaps. Notice the square mirrors, very popular item for some time. A little fuzzy, but I could not resist to share this late 40’s color photo of this mildly restyled ’37 Ford sedan in this article. Wide whites, single bar flipper hubcaps, 48 Ford bumpers, smooth hood-sides, small spotlights, chrome plated sealed beam headlights and a nice dark red paint job. Love the owners outfit as well. 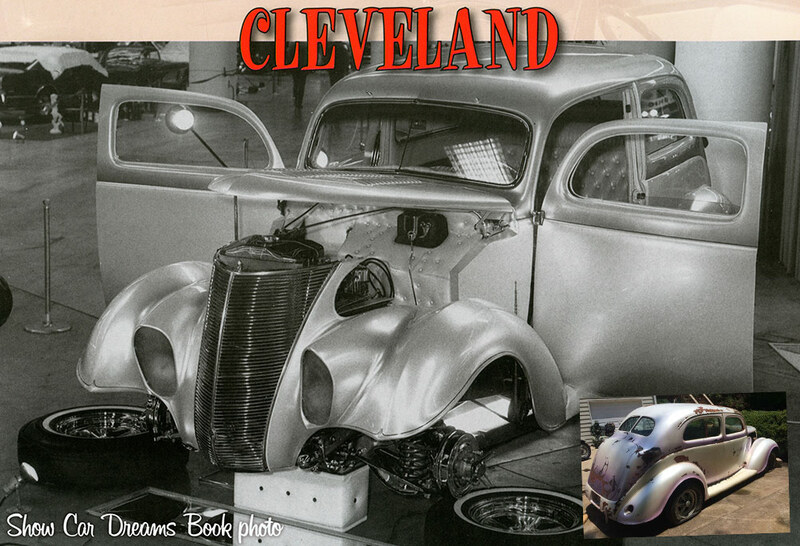 Carl Kasprzyk used a ’37 Ford Sedan as the base for his Custom Restyled Show Car in the early 1960’s. The car was recently “found”. The 1937 Ford has gained a bit more popularity of the last few decades, but more as Hot Rod and Street Rod than as Custom Car. When I researched this article and did a google search for ’37 Ford or ’37 Ford Custom, it was chocking to see how few actual Custom Cars showed up in the search. 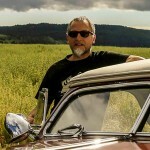 And most that show up are based on modern fiberglass based cars, which have nothing to do with the Custom Cars we talk about here on the Custom Car Chronicle. Fortunately there are a few exceptions. 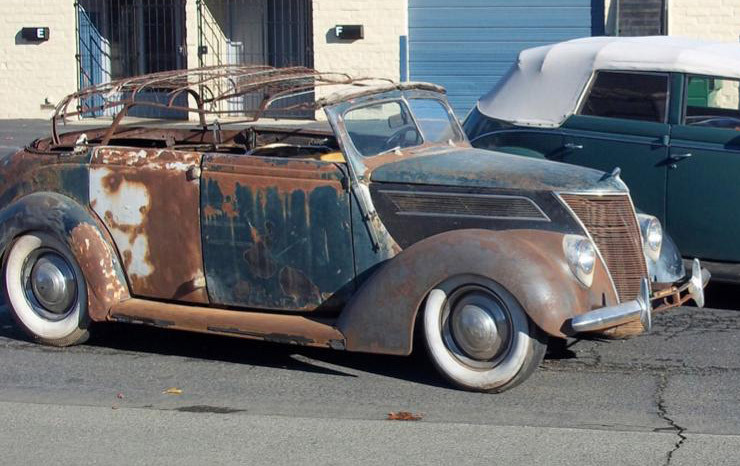 Rick Dore used a ’37 Ford Coupe for a car he build for James Hetfield, and there are a few others that are currently in the works with an more traditional Custom feel. So hopefully more will follow. I think that these ‘s37 Ford Ugly Ducklings” can look very good as a nice period perfect 40’s Custom. 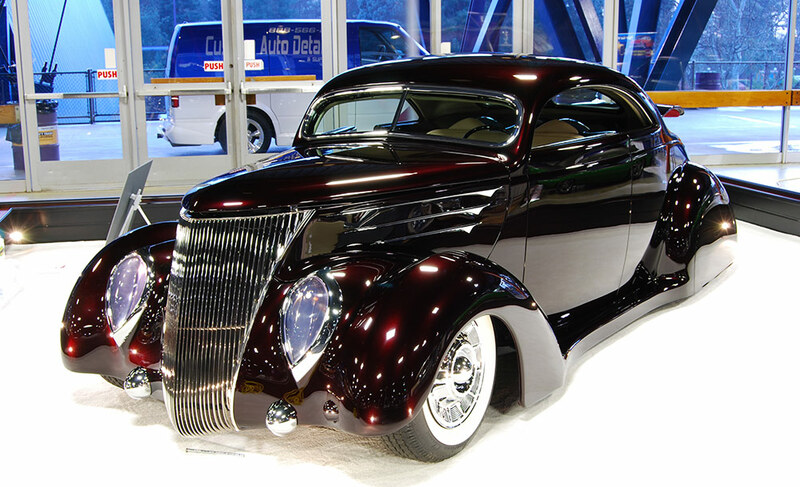 Rick Dore used a ’37 Ford Coupe as base for his “The Crimson Ghost” Custom version created for James Hetfield. This one has a lot of body work going on including chopped hard-topped roof, reshaped fenders and molded in coke bottle shaped running boards, custom grille and head and taillights. I spotted this ’37 Convertible parked outside at the 2013 GNRS. Lowered, chopped windshield with chopped folding top, skirts, white walls with single bar hubcaps, custom side trim and rock shield on the rear fenders. Very much Custom styling, but the missing hood sides and louvred hood give it a somewhat Hot Rodded look. This one is actually a Photoshopped image. The car is a nice mildly customized ’37 Ford with wide walls and Sombrero hubcaps, skirts and the right stance, but I digitally added the chopped windshield and top, just to show how nice these cars can look. 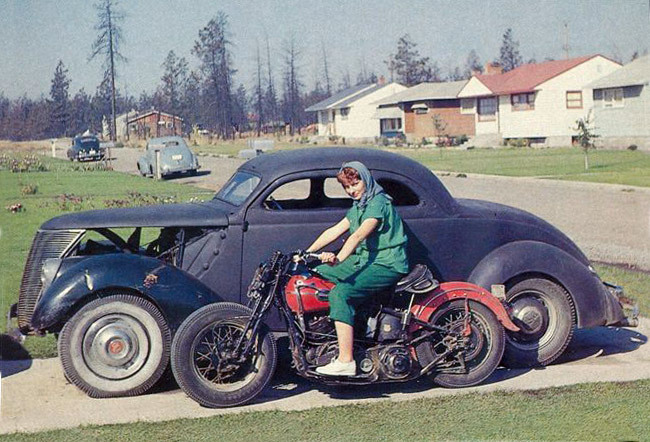 A few more Custom Restyled ’37 Ford snapshots, showing that even though the ’37 might not have been as popular as its predecessor, the ’36 Ford, it was still used as a Custom Base, both mild and wild. 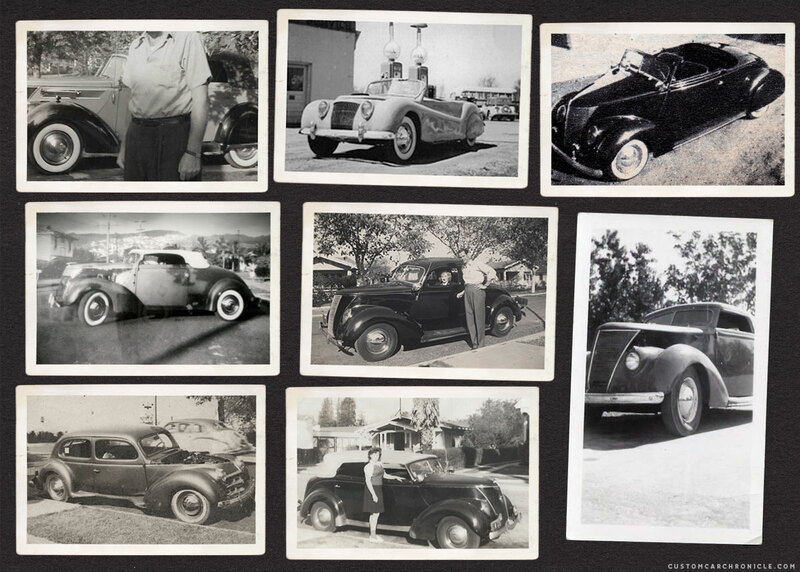 Great photo collection to show how nice a kustom ’37 Ford can look. I have always thought the front end was beautiful and lends itself nicely to being customized…that chopped, padded top Club Cabriolet looks especially nice!